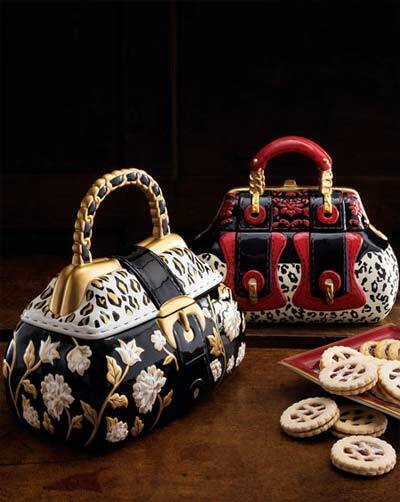 Check out these ceramic handbag cookie jars. It is not just a cookie jar; this could also be used as a beautiful centerpiece for the cooking fashionista. What a cool thing to have in your kitchen; something that says style and class as well as fresh baked goods – a decorative item that will set a colorful vibe in your kitchen. Oh, yeah, and these hand-painted ceramic cookie jars also do a nice job of storing cookies, jam tarts, biscuits and more. Red and black jar, 9.5W x 6.5D x 9T. Black and white jar, 11W x 7D x 9T. 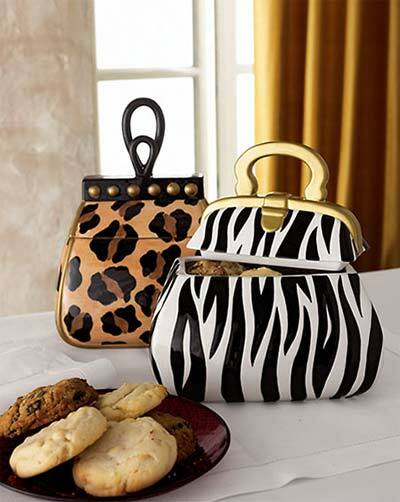 You may also like the Zebra handbag cookie jar: 9W x 6D x 9T or the Leopard handbag cookie jar: 8W x 6.5D x 10.5T. This is a piece of style for you and your guests to enjoy, or benefit anyone else you like; a centerpiece of class in the kitchen. It’s munch time!